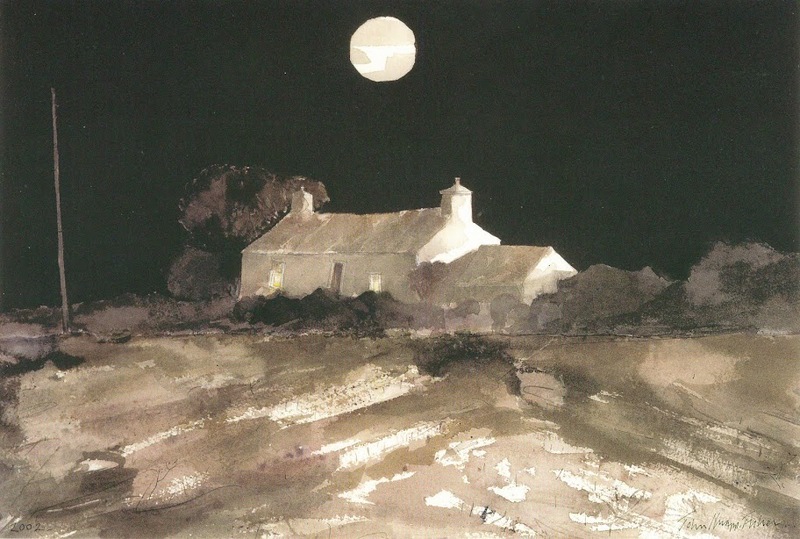 I was saddened to read of the death this week of the poet of Pembrokeshire landscape painting, John Knapp-Fisher. 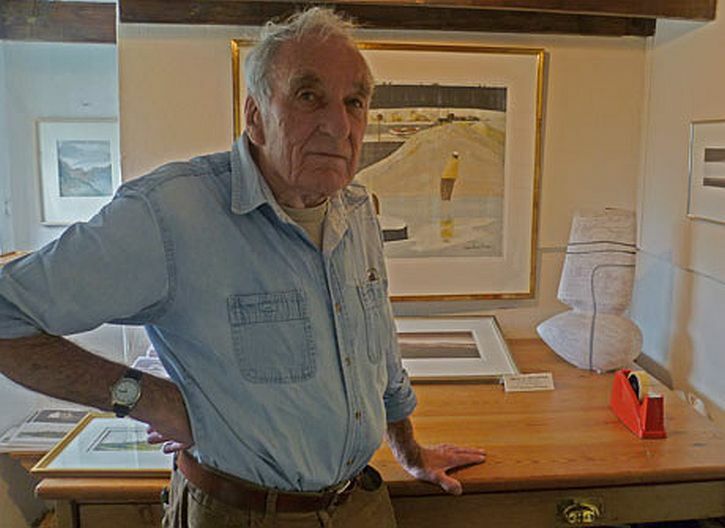 He was one of the few artists I have shaken by the hand, the result of having sought him out at his small roadside studio and gallery at Croesgoch on the road to St David’s in 2011. 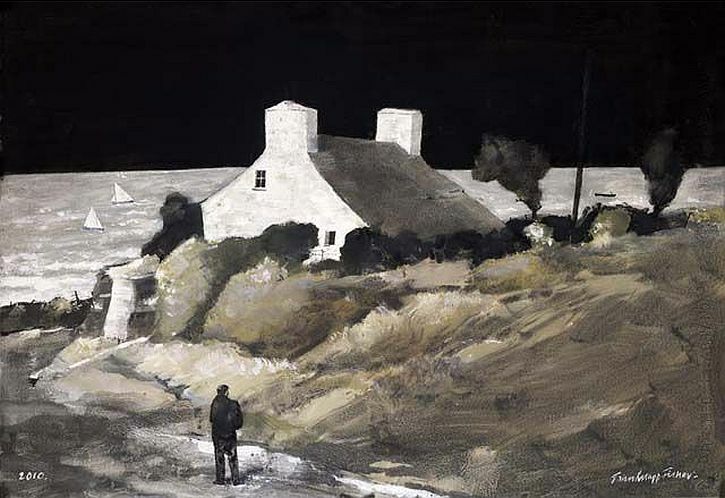 Then, he was approaching his 80th birthday, and the reason for our quest was that we had known and admired his work for thirty years, having discovered it while we were on holiday in Pembrokeshire. 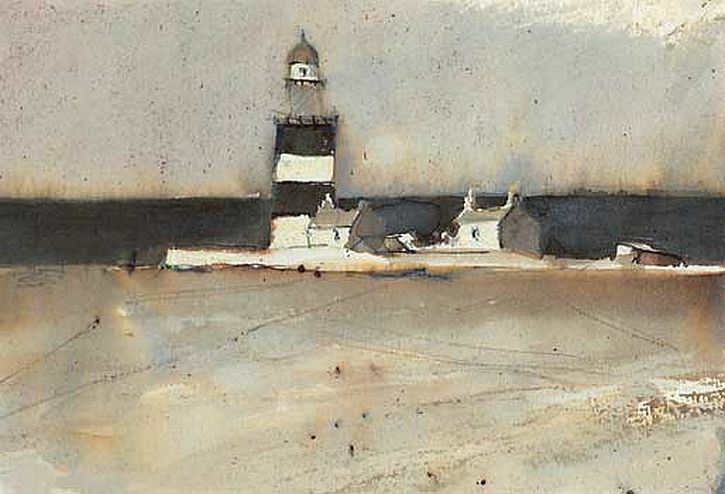 Born in London in 1931, he moved to west Wales in the 1960s. 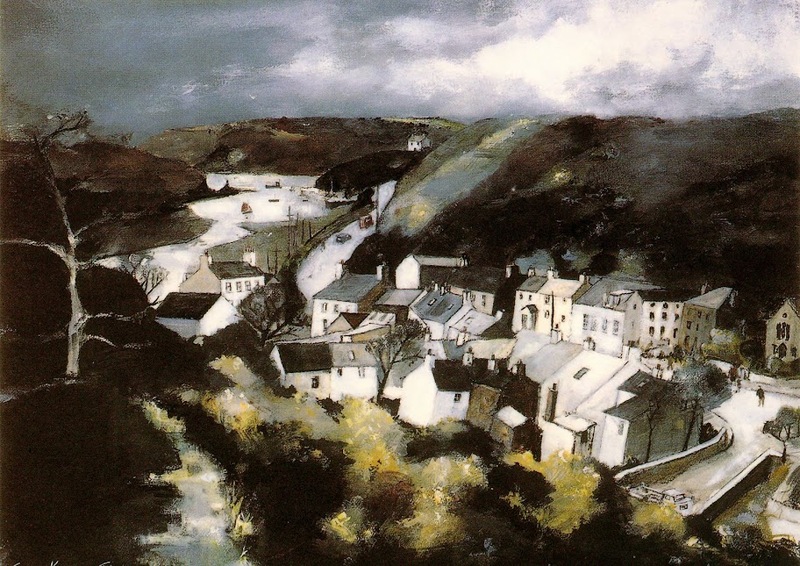 It was there that he began to paint his distinctive landscapes, inspired by scenery near his studio in Croesgoch and the harbour at Porthgain. 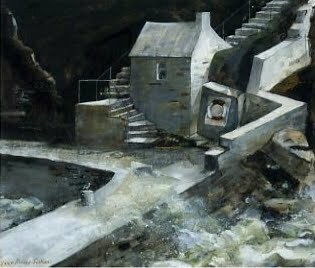 Our first encounter with the work of John Knapp-Fisher was when we came down to Pembrokeshire in the 1980s. 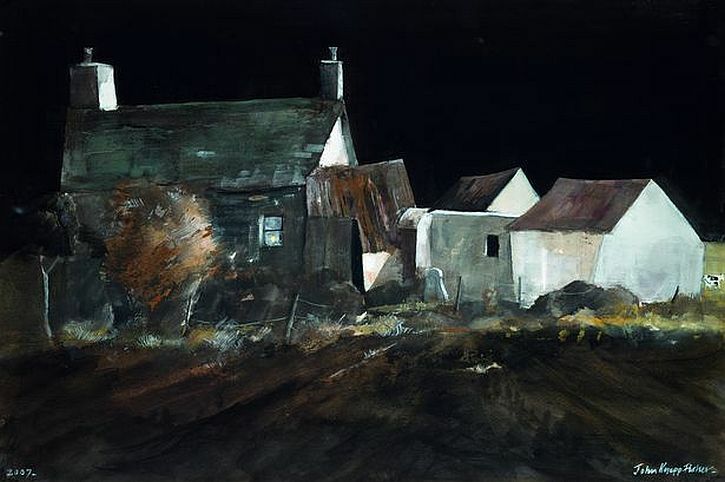 We came back with postcard reproductions of his distinctive watercolour and ink paintings with their limited palette of earth colours and striking chiaroscuro, often depicting brightly-lit whitewashed buildings emerging from a dark background (below). 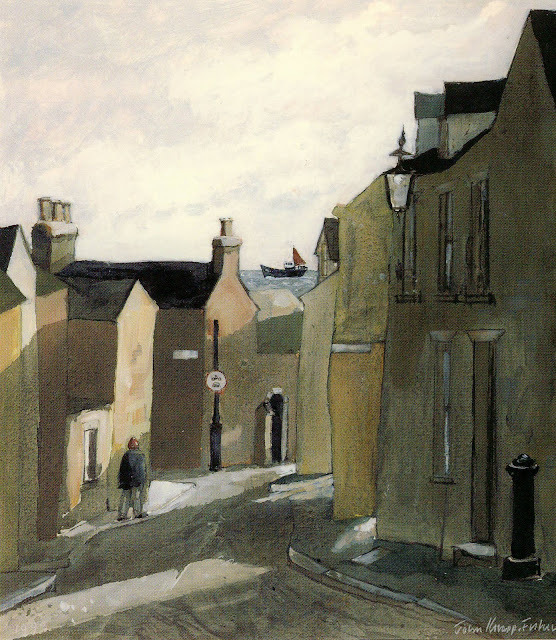 John Knapp-Fisher was born in 1931, studied Graphic Design at Maidstone College of Art from 1949, and later worked for the theatre as a designer and scenic artist. 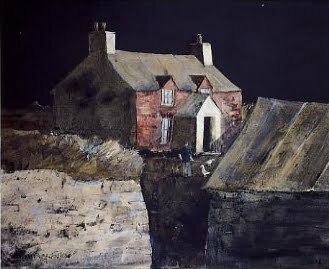 He moved to Pembrokeshire in 1965 and two years later opened his studio gallery in Croesgoch, a small village strung out along on the Fishguard to St Davids road. 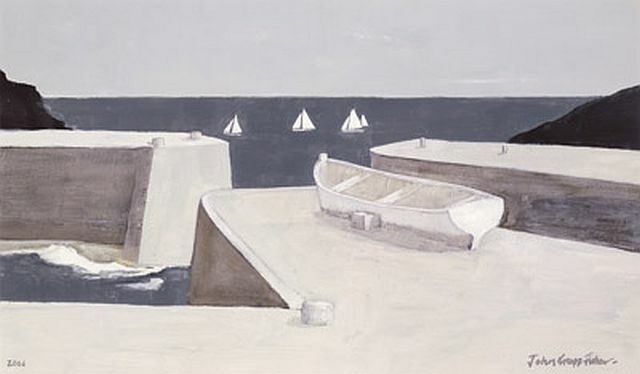 Among the artists that Knapp-Fisher identifies as influences have been painters of the Cornishschool like Ben Nicholson and Alfred Wallis, as well as John Piper. 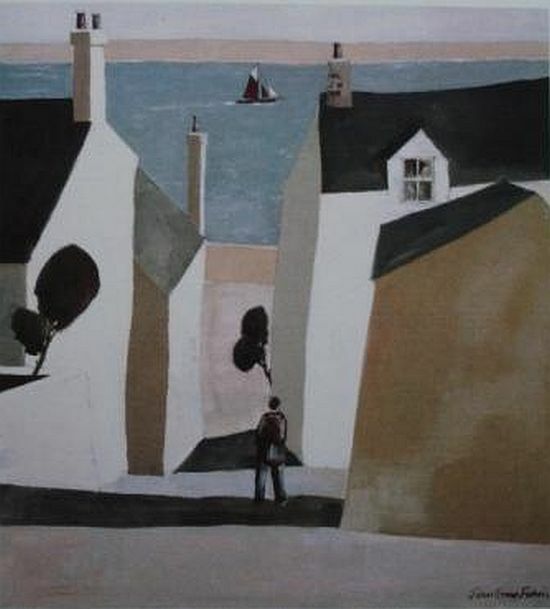 In Cresswell Street, Tenby (above), the boat on the skyline seems to be a humourous nod to Wallis, as well as being a reflection of Knapp-Fisher’s lifelong love of boats and the sea (he has built them, sailed them and lived aboard one for several years). 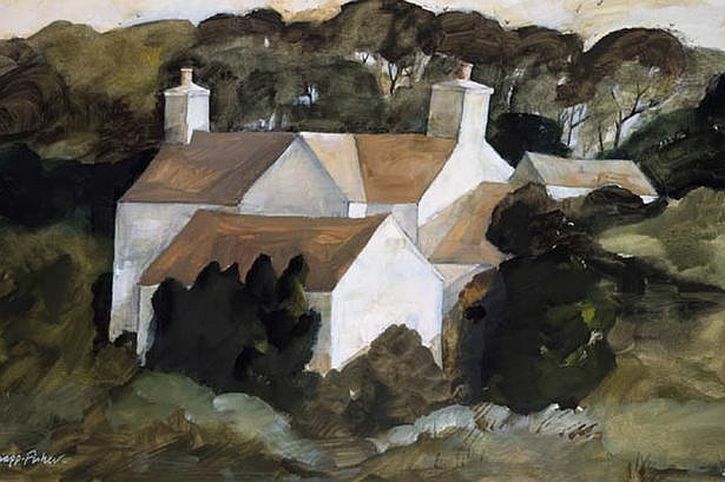 Knapp-Fisher’s name has become synonymous with Pembrokeshire landscape painting and his work is highly sought after by collectors in Britain and abroad. 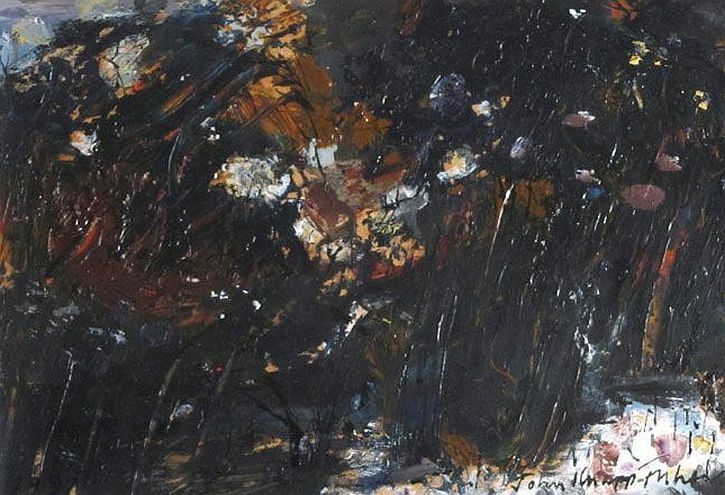 He has exhibited widely and is now, as he approaches his 80th birthday, one of Wales’ most popular and well-known artists. With my work I tend to concentrate on small areas, often within walking distance of where I live. 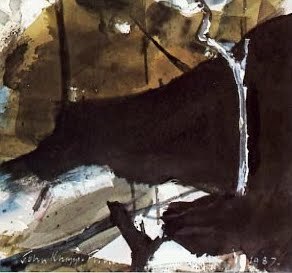 I will go out in all lights and weather making notes and sketches – sometimes finishing the picture (if in small format) on the spot. 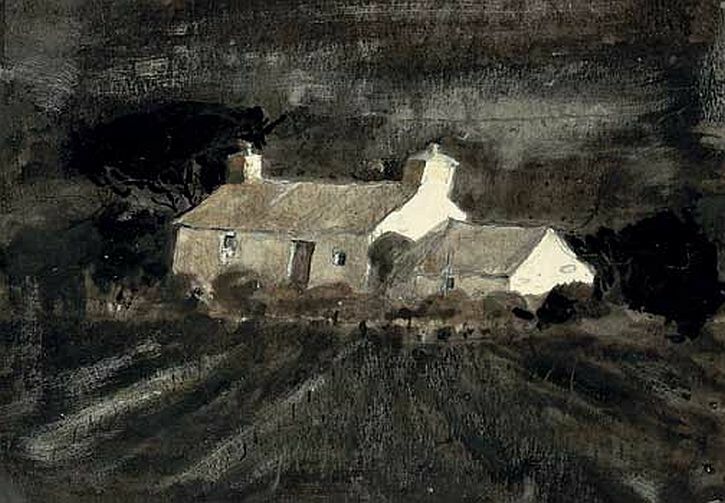 I am probably best known for ‘dark’ dramatic paintings with buildings catching the last rays of the sun against a stormy sky. 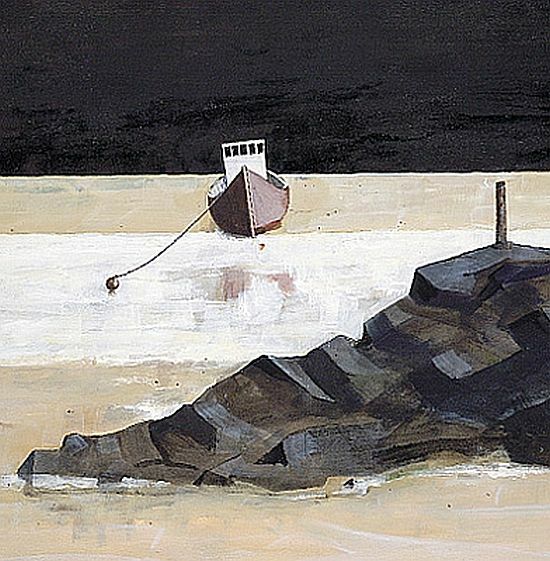 … Most of the paintings in this oeuvre are inspired by day subjects of a light often seen on the north west Pembrokeshire peninsula. 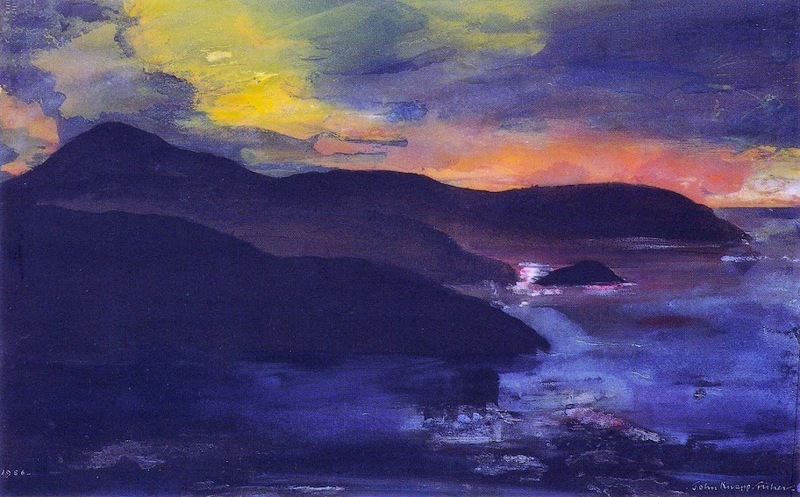 An example is ‘Abereiddy Evening’ (1974), below. 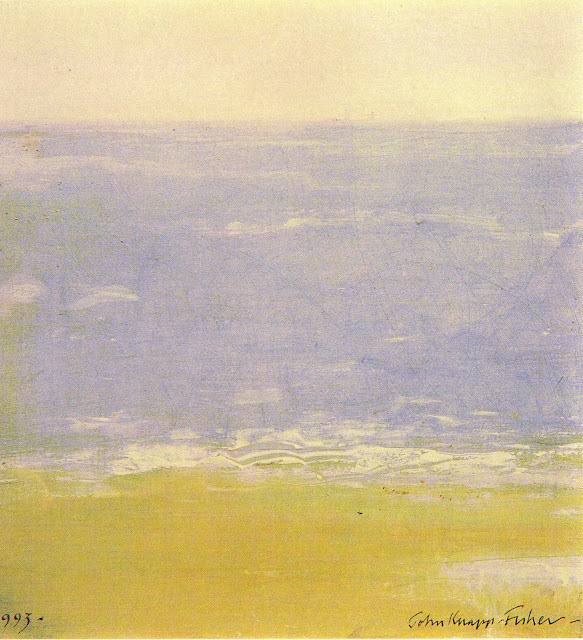 Most of John Knapp-Fisher’s early Pembrokeshire paintings were done with inks and watercolours, but recently he has turned more to oil, and utilised a wider colour palette, as in ‘Beach and Sky’ (1993) and ‘Sunset North Pembrokeshire Coast’ (1986), below. Anecdotal views – pretty ‘photographic’ subjects are of no interest to me. Pembrokeshire, like many other beautiful holiday areas, attracts artists who cater solely for the tourist industry. I believe in decentralisation. 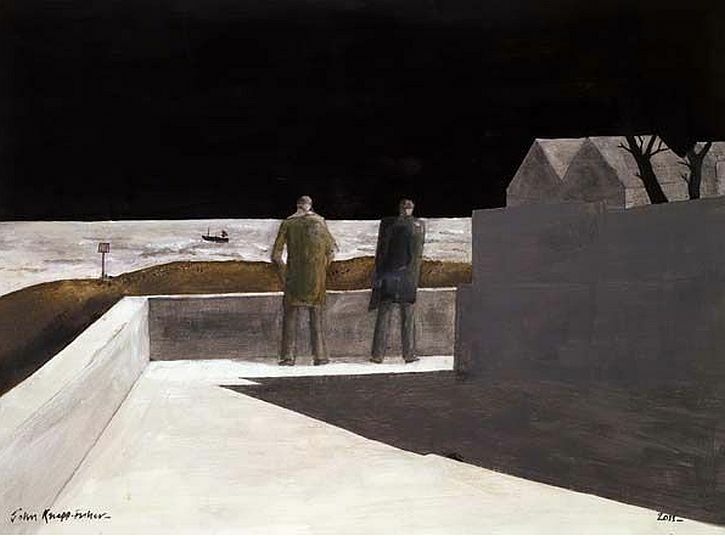 Why should London attract serious painters … while Pembrokeshire is relegated to a state of mediocrity? 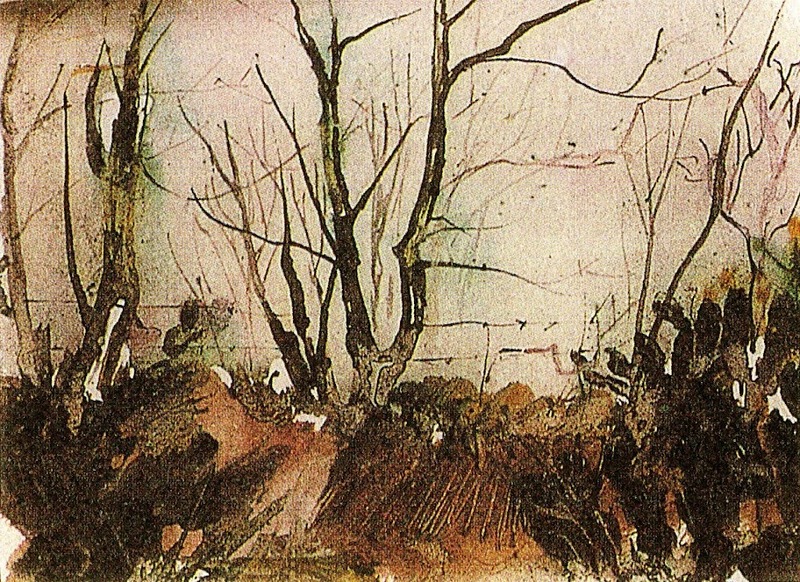 Distinguished painters have worked here in the past – Turner, Sutherland, Piper, Richard Wilson, Augustus and Gwen John, and David Jones – as well as a significant number in the present, both young and old. I have worked at my art when my spirits have soared and when I have felt low and alone. I hope to continue to wander the paths and lanes, the seashores, farmyards and hills – sketchbook in hand. Wonderful post. 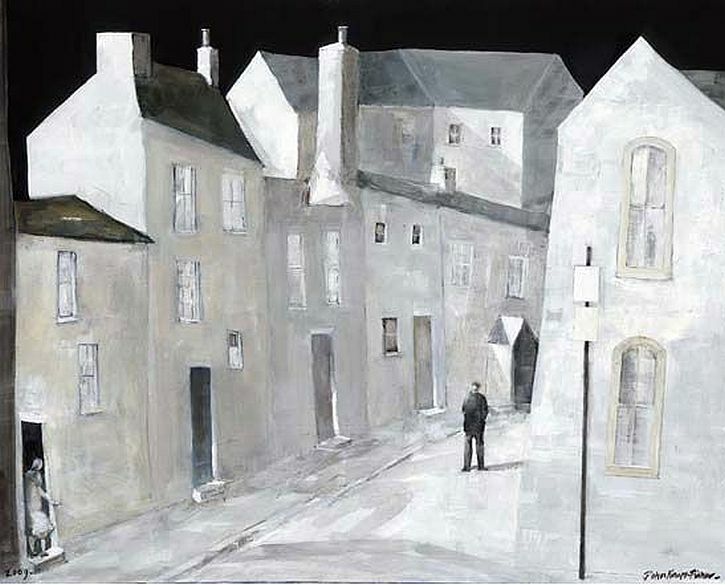 His paintings are so atmospheric yet seem so simple in style. They are really beautiful. Fascinating to read about him and see some examples of his work. Hope in a couple of weeks to thenew Hockney Spring paintings at Salts Mill, very exciting. I loved this post and the simplicity and beauty of the paintings. Gerry, thanks for the post about John Knapp-Fisher. 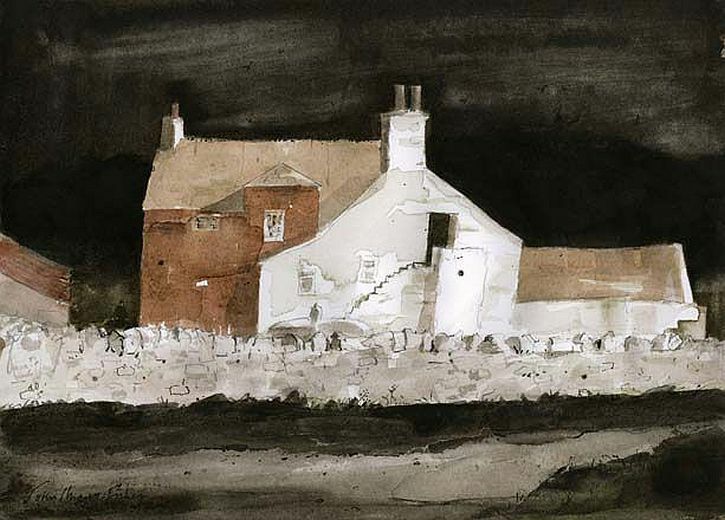 What beautiful paintings and drawings that evoke such a strong sense of place. I am amazed that he was not better known, but then the art world is not a meritocracy.